It appears that the old-fashioned NHL enforcer may be an endangered species. With what we now know about the long-term danger of concussions, plus the recent rash of tragic deaths of NHL tough guys, there’s just no room in hockey anymore for guys whose only skill is beating other guys to a pulp. Some hockey commentators and analysts may call this change a travesty, but from a health point of view, you can’t deny that this shift in thinking is a good thing. Nobody wants to see people get hurt or die young. Still, no matter how much I know about the science of head injuries, there is a deep, dark part of my hockey-loving soul that will be sad to see the goons go. 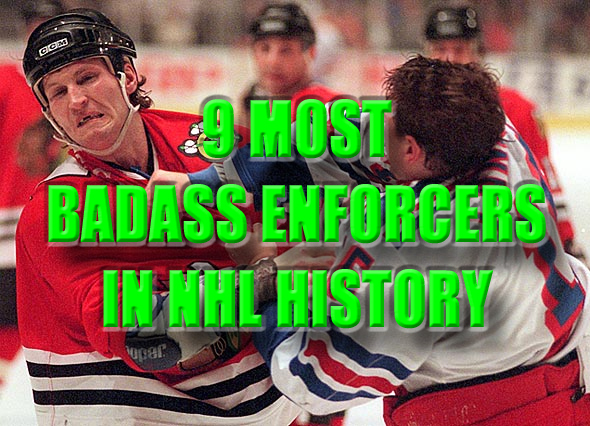 So in honor of those simpler days when we didn’t have to feel guilty about seeing guys get their heads smashed by giant marauders on blades of steel, today’s list runs down the biggest, scariest, most badass enforcers in the history of the NHL. The Boston Bruins’ Terry O’Reilly never led the NHL in penalty minutes, averaging only 2.35 minutes per game throughout his 13-season (1972-1985) career. Also, he racked up 204 goals and 402 assists—solid numbers you don’t normally associate with an enforcer. But you don’t get nicknamed “Bloody O’Reilly” for your offensive production. On December 23, 1979, O’Reilly got into a huge fight after a game at Madison Square Gardens…WITH THE FANS. Sick and tired of being harassed (verbally and physically), O’Reilly and his teammates jumped over the glass and started pummeling rowdy spectators. It was one of the most infamous incidents in the history of the NHL. The Toronto Maple Leafs’ Tie Domi averaged 3.44 penalty minutes per game for his career, a rate with ranks as the 5th highest in the modern era. He’s also 3rd on the list of career penalty minutes, and 14th on the list of highest single-season PIM totals (365 in 1997-98). If you could measure NHL enforcers on penalty minutes alone (you cannot), this Toronto fan-favorite would be much higher on the list. Domi was never the most feared fighter in the NHL but, always willing to throw an elbow or sucker punch (see video) behind the play, he was certainly one of the most dangerous. 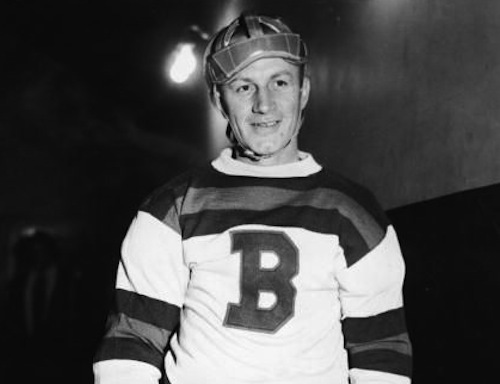 Eddie Shore played for the Boston Bruins from 1926-1940, and is easily the most skilled player on this list. He won the Hart Trophy as the leagues most valuable player four times—the most for a defenseman, and third all-time behind only Wayne Gretzky and Gordie Howe. But Eddie Shore was not known simply for his talent. He was also one of the most vicious players the game has ever known. In the 1927-28 season, shore racked up 165 penalty minutes. That was a record for an age when they only played 44 games, and when you had to practically kill somebody to get a penalty. And speaking of almost killing somebody…yeah, Eddie Shore did that. 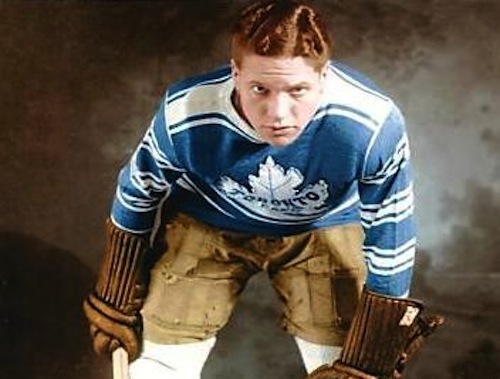 On December 12, 1933, Shore checked the Toronto Maple Leafs’ Ace Bailey from behind. He hit his head on the ice, fracturing his skull. Luckily, Bailey’s life was saved by a 4-hour surgery, but he never played hockey again. Marty McSorley ranks 4th in career penalty minutes with 3,381, and in 1992-93 put up the 5th highest single season ever with 399 minutes. Overall in his career, the guy averaged a nasty 3.52 penalty minutes per game. As an enforcer, McSorley is famous for two things. First, he was basically Wayne Gretzky’s on-ice bodyguard when he played for the LA Kings. If you even thought about touching the Great One, McSorley would give you a beating. Second, McSorley was on the giving end of one of the worst instances of excessive on-ice violence in NHL history. On February 21, 2000, Marty (then of the Boston Bruins) whacked fellow enforcer Donald Brashear of the Vancouver Canucks in the side of the head with his stick, knocking Brashear out cold right there on the ice. That would be McSorley’s last NHL game. He was charged with and convicted of assault and suspended by the NHL for one year. Clark Gillies definitely was not a typical modern NHL enforcer. Playing with the New York Islanders during the height of their dynasty, when they won 4 Stanley Cups in a row from 1980-1983, Gillies scored 30 or more goals 6 times, including a 38 goal performance in 1981-82. Yet Gillies’ primary role with the Islanders was that of the enforcer, charged with looking out for his superstar linemate Mike Bossey. The reason Clark Gillies does not have the impressive penalty minute totals other famous enforcers have is because other players were too scared to mess with him. During his rookie season in 1974-75, the 6’3” Gillies beat the crap out of the Philadelphia Flyers’ Dave Schultz, who was at that time the NHL’s #1 tough guy. From that point on, the mere fact that Gillies was present at a game kept people in line. And when other big-time enforcers did take a crack at Gillies, they usually lost. During the 1980 playoffs, Gillies won several fights with Boston tough guy Terry O’Reilly (#9 above). Bob Probert averaged 3.53 penalty minutes per game for his career, ranks 5th on the list of career penalty minutes, and has the 6th highest single-season total (398 minutes in 1987-88) of all time. He was simply the best fighter of his generation. Moreover, he would stop at nothing to protect his teammates. Why, just look at this video. Steve Yzerman get in over his head against Sabers tough guy Kevin Maguire. Probert is enraged that Maguire would take advantage of a “non-fighter,” and storms around the big fracas just trying to get his hands on him. (While he’s waiting, he handles a couple other Sabers players.) Finally, there is a clearing, and Probert goes in and punches Maguire while he’s down on the ice, just so he knows that there are always consequences. Red Horner was the enforcer for the Maple Leafs from 1928-1940. Like Eddie Shore, you can’t measure his accomplishments as an enforcer simply by penalty minutes accumulated, because he played in an era where penalties were only called if teeth were lost (and sometimes, not even then). So you have to look at Horner’s career in its context. And here it is: he led the league in penalty minutes 7 times. Seven. When he retired in 1940, Horner was the all-time leader. In 1935-36, he led the NHL with 167 penalty minutes in 43 games. In 1938 he led the league with 85. If 85 was enough to lead the league, then it’s safe to assume, most of the time, guys didn’t get much more than that. So Horner’s 167 in 1935-36 is relatively astronomical. Oh, and you know that story about how Eddie Shore ended Ace Bailey’s career in 1933? Well, right after Shore sent Bailey to the hospital, Red Horner sent Shore to the hospital. He punched Shore, knocking him to the ice and opening a gash that needed seven stitches. Tiger Williams spent most of his 14 year (1974-1988) NHL career with three teams: Toronto, Vancouver, and Los Angeles. His 3,966 career penalty minutes ranks #1 all-time, and his 4.12 penalty minutes per game ranks #2 in the modern era. Tiger was never as famous as some of the other guys on this list (like O’Reilly—maybe because he wasn’t as good a figher? ), but the numbers don’t lie: this guy wasn’t afraid to get his fists bloody. You knew the #1 NHL enforcer of all time had to be a “Broad Street Bully,” didn’t you? Was Dave Schultz the the best fighter? No. Not even close. He was more goon than a skilled henchman. But he was probably the most willing fighter in the history of the game.